When considering icons of Restless Thinking it’s hard to miss Elon Musk. An immensely driven technology entrepreneur who, as an introverted 10-year-old, taught himself how to code. By 12 he had made his first software sale – A game called Blastar. By 17 had left his native Pretoria, South Africa to attend Queen’s University, Canada. After 3 years at Queen’s in Ontario, he left to study business and physics at the University of Pennsylvania. He graduated with an undergraduate degree in economics and stayed for a second bachelor’s degree in physics. Throughout his career Musk has always seemed to be at the cusp of both technology innovation and shifts in popular cultural thinking. After leaving Penn State, he gravitated to Silicon Valley, his appearance perfectly timed with the pre-internet boom days of 1996-99. He famously secured a place to study for a Ph.D. in Physics at Stanford and left after only 2 days to set up his first company. This company – Zip2 Corporation, was an online city guide that was very quickly providing content for both The New York Times and The Chicago Tribune along with a further 160 American newspapers. Compaq Computer bought Zip2 in 1999 for $307 million and $34 million in stock options. Rather than sit back and enjoy the money, Musk co-founded X.com, an online financial services & payments company. An X.com acquisition the following year led to the creation of PayPal as we know it today and in October 2002, PayPal was acquired by eBay for $1.5 billion in stock. Before the sale, Musk owned 11 percent of all PayPal stock. Driven to see what’s over the horizon and the future preservation of the human race have become the cornerstones of everything Musk does. In 2002 he founded SpaceX, with the intention of building spacecraft for commercial space travel. By 2008, (just 6 years) SpaceX was awarded the contract to handle cargo transport for the International Space Station by NASA, with plans for astronaut transport in the future — replacing NASA’s own space shuttle missions. In 2003 Musk formed Tesla Motors with Martin Eberhard, Marc Tarpenning, Jeffrey Straubel, and Ian Wright. Just five years after formation, Tesla released the Roadster, a totally electric sports car with a 250-mile range – at a time when the public perception of electric cars was that they were slow, ugly, badly made with terrible ranges. The car is widely credited with springboarding electric car development globally. Bob Lutz the VP at General Motors credits The Roadster with being the reason they started the Chevrolet Volt program, which then led to the Nissan Leaf program. All from a production line that was capped at just 500 units per year. This year Musk and Tesla released their latest electric vehicle, the Model 3 – aimed squarely at the family saloon market, the car has a range of 200 miles, a sub 6-second 0-60 time and a retail price of £35,000. Pre-orders of the vehicle passed 100,000 units by the launch event and over 400,000 units by the time the vehicle was actively ‘on-sale’. 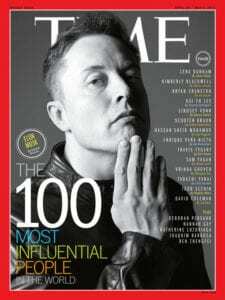 It’s widely acknowledged that much of what Musk gets involved in becomes extremely successful. In 2016, in his continuing efforts to promote and advance sustainable energy, Musk initiated a $2.6billion dollar deal to purchase SolarCity Corporation, a company he had actually helped his cousins start 10 years previously. The deal essentially solidified his electric car, storage and solar energy companies creating a closed loop that can create fully integrated residential, commercial and grid-scale products that improve the way that energy is generated, stored and consumed. Why is he an Icon of Restless Thinking for us? Perhaps it’s the fact he’s created four multi-billion companies by his mid-40s — in four separate fields (software, energy, transportation, and aerospace). Conventional wisdom says that in order to become truly world-class, we should only focus on one field. Musk breaks that rule. His expertise ranges from rocket science, engineering, physics, and artificial intelligence to solar power and energy. He’s widely known for being extremely good at transfer learning or ‘inductive transfer’, which is essentially the learned skill of being able to take the knowledge gained in one field and transferring it to another unrelated one. It is this ability to transfer experience and learning into new fields that mark him as a truly #restlessthinker. Being truly restless in our thinking encourages an open minded approach to problem-solving, which is at the core of what we do at Restless. It is our aggregate of shared experience and learning that allows us to create unique approaches to problem-solving as a team. It is this approach to building brands and creative problem solving that differentiates us from other in our field.